Be extremely careful of the deadly combination of water and electricity. Also, be cautious of slippery wet carpets and floors. Stay away from raw sewage backups, which contain nasty bacteria and can be harmful to your health. If you haven’t located the source of the water, call us immediately (24 hours-a-day) and we’ll guide you through the process. Our 24 Hr Flood Damage Restoration Service is available 24 hours a day, 7 days a week. We always pick up the phone. Call us now! After you call us we are on our way. 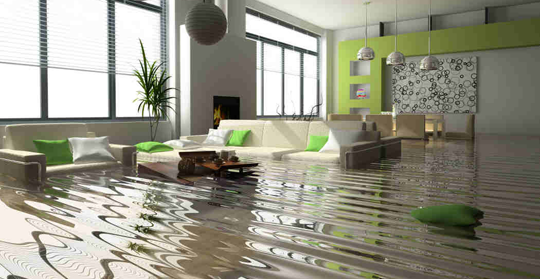 We can help minimize any water damage you might incur. Wood furniture will cause stains which cannot be removed. Rust stains from metal are difficult to remove and may be permanent. It’s not really dry until our instruments say that it is dry. We use very high tech moisture meters to determine if all materials are dry. Many companies may guess and hope that materials are dry without really knowing for sure. When this happens the possibility of permanent damage or mold escalates dramatically. Our water restoration technicians go to school in order to learn the proper way to measure and record all wet surfaces that they may encounter in a water restoration job. We also guarantee all water restoration jobs for one year. When your house is at risk choose a company that knows the proper methodology that is required.